A busy poultry house in Washington, North Carolina raises chicken and produces eggs. If you’re not familiar with chickens, it can be quite a shock to open the coop door and be confronted with masses of feathers around. And the feathers do fly, particularly with a high efficiency ventilation system continuously recirculating air throughout the facility. 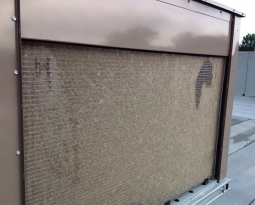 Feathers were getting sucked into the numerous air intakes and clogging up the HVAC system. 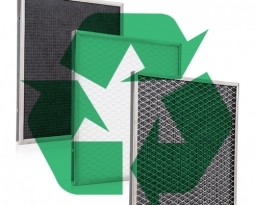 Permatron’s PermaCool® air filter media is a unique 1/4″ corrugated polyproylene filtration media whose electrostatic charge assists in filtering dirt, dust and other irritating pollutants from the air. 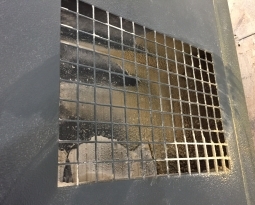 The filter media is a dense, 3 layer, waffle weave configuration, which enhances its filtration abilities and creates a rigid/durable electrostatic air filter with the convenience of a cut-to-fit solution. Unlike other filter media which may compress and restrict air flow, PermaCool retains its low resistance design after installation. 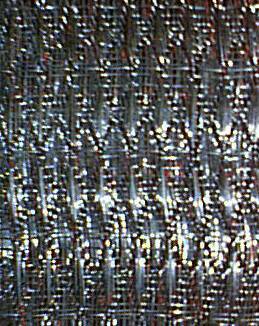 The media’s smooth fibers are easy to clean, reuseable and will not degrade over time as foam does. 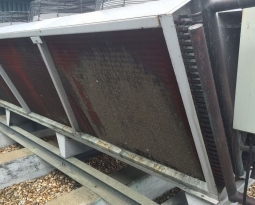 Each air intake filter was easily cut-to-fit on site and slid into filter holding brackets.